A koala who became a symbol of hope following Australia’s Black Saturday bushfires has been stuffed and put on display in a museum, following her death. 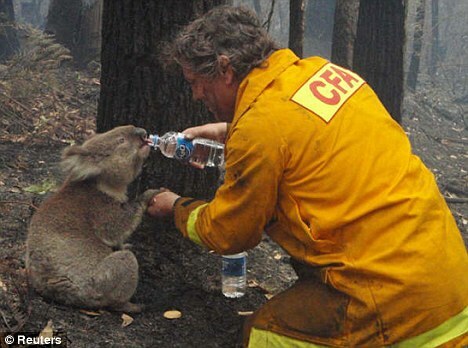 Sam shot to fame after being pictured drinking from fireman David Tree’s water bottle during the 2008 Melbourne fires, which claimed 173 lives. Sam herself was badly burnt in the blaze but recovered from the third-degree burns on her paws after being cared for by a volunteer at the Southern Ash Wildlife Shelter, where 100 fire-injured koalas recuperated after the inferno. 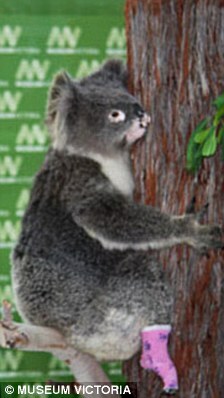 ※PIC--Immortalised: Sam the koala has been stuffed and exhibited at the Melbourne Museum . 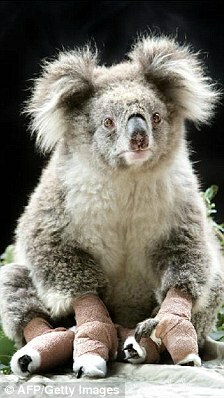 ※PIC--The marsupial shows off her bandages following the bushfires of 2008. Sadly, Sam died in August last year, after being stricken with Chlamydia, which affects around 50 per cent of Australia’s koala population. Now Sam, who was even publicly grieved by Prime Minister Kevin Rudd, has been stuffed and is on display at the Melbourne Museum. The exhibit shows Sam in her recovery phase, complete with pink bandages covering her burns. Patrick Greene, who is chief executive of the Museum Victoria, said he hoped the exhibit would educate the public about the tragic fires. The fires destroyed more than 2,000 dwellings, leaving 7,500 people homeless in Victoria.